It's hard to believe that we are already at the beginning of May. I apologize for the lateness of this month's newsletter, but spring continues to be a busy time in the office, especially with participating in outdoor community outreach events and giving school presentations. April 2015 was definitely one for the record books here in the state. If you thought it was unseasonably warm, you were correct! The state average temperature for the month was 75.4˚F, which beat out the old record in April 1908 of 74.7˚F. It was also a wet April, which is not typical. April tends to be one of the driest months on record across the state. So with those tidbits of climate trivia you can use to amuse your friends, here are a few of the comments that caught my attention in April. FL-HB-10 on 4/1/2015: "After a pleasant overnight low of 63�, daybreak brought clear skies, sunrise sunbeams, gradual warming, and an eventual afternoon-long daytime high of 86� at my South Tampa location today." FL-ES-24 on 4/20/2015: "Yesterday morning at 0730 coming from West Fl Hospital I ran into 2 squall lines with rain so heavy that it was dark as night. The first area was on I-110 at Davis Hwy for approx 3 miles. The other was on Barrancas Avenue all the way out Gulf Beach Highway to cement plant on Sorrento Road. White knuckle driving. Only recorded 1.83 at my location so the big stuff skirted my location." FL-MR-12 on 4/20/2015: "High 83.5 @ 2:03 PM, Low 68.8 @ 6:51 AM. 0.0 HDD, 5.5 CDD. Baro High 29.86 @ 11:20 AM, Baro Low 29.75 @ 6:50 PM. EF1 Tornado hit 6 miles west of this station, destroying/damaging 70-90 homes in the Oak Run/Palm Cay location with 70/90 MPH winds and traveled about 2 miles." FL-DV-47 on 4/26/2015: " Some serious thunderstorms swept through Saturday afternoon. Strong winds, dime-sized hail, heavy rain. Duration wasn't long but the storms were intense." FL-BV-13 on 4/30/2015: "Quite the dud. These Gulf systems are notorious for little effect on the Fla. east coast, despite what happened earlier in the month. Nevertheless, a good rain month - see May 1. Nice cold air mammatus cloud deck this morning." We are quickly approaching the start of the 2015 Hurricane Season. Last year, the east coast of the state was impacted by high surf from Hurricane Arthur as it moved north of the coast of Titusville before brushing the Outer Banks. Beyond that, 2014 was another quiet year for Florida. Forecasters will issue their predictions for the upcoming season by the end of May, but now is the time to start preparing. 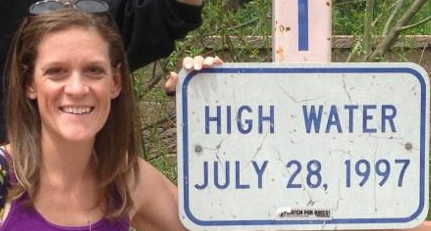 June 1st marks the beginning of the year's Hurricane Season, which runs until November 30th. It's been a 10 years since Dennis, Katrina, Rita and Wilma rattled an already reeling state from the 2004 Hurricane season. 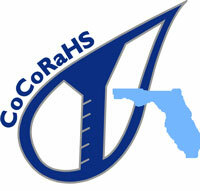 We've enjoyed a rather quiet time since 2005, but Florida is always at risk during each hurricane season. You see me mention this every year, but it is important that you and your family have a hurricane kit and plan. So when an impending hurricane threatens your area, you are ready to act. This month, Ric shared another round of stunning pictures he'd taken with his Celestron telescope. 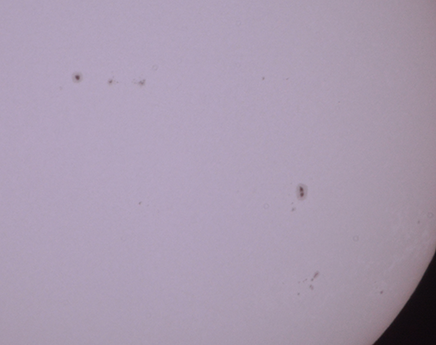 This time, he was able to photograph some sun spots. 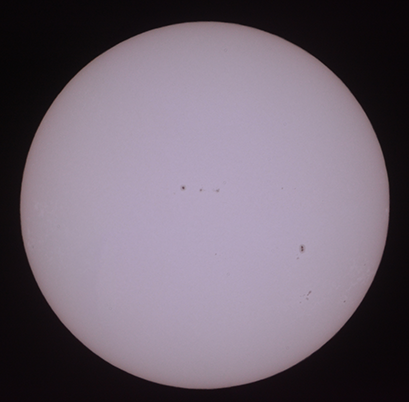 He states that photographing sun spots should only be done if you've have proper instruction, since if done wrong, you could damage your eyesight. There are several groups of sun spots, which he mentions has been the most activity he has since in a long time. With the exception of some areas along the West Coast, the entire state had rainfall totals above normal (Figure 1). 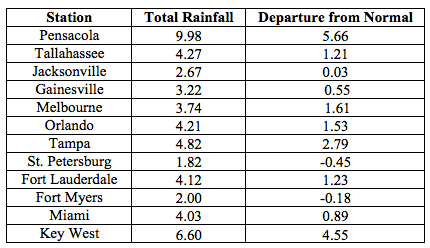 Departures from normal roughly ranged from -0.45" to 5.66" (Table 1), though localized parts of the state saw rainfall totals that were as much as 2.00" below normal to 8.00" above normal (Figure 1). 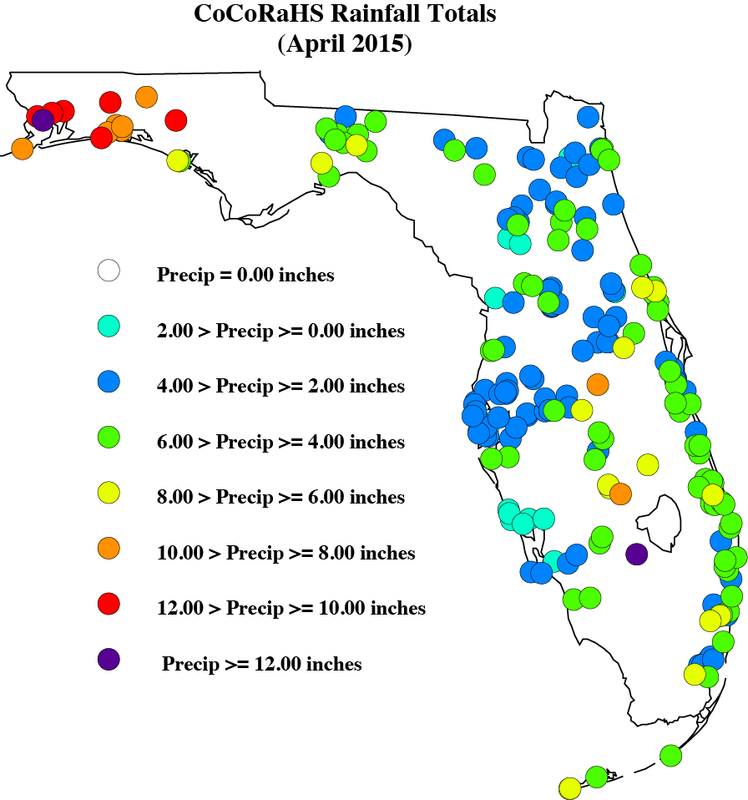 April 2015 was the 5th wettest on record at Key West, the 7th wettest in Orlando, and the 10th wettest for both Pensacola and Vero Beach. 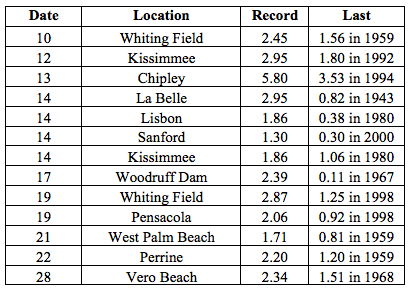 There were multiple 24-hour precipitation records broken for the month (Table 2). At the end of March, nearly 24% of the state was experiencing abnormally dry (D0) conditions, with the main concentration of the dryness located in the western Panhandle and southern Florida. 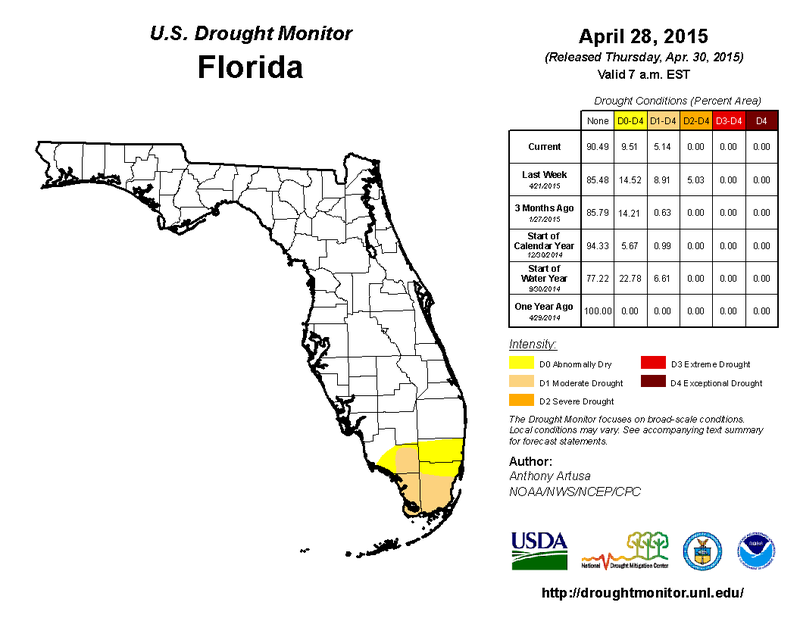 The lack of rainfall at the beginning of April led to the expansion of dry conditions (D0) into more of the Panhandle and Big Bend (Gadsden, Leon and Liberty counties), as well as South Florida (Collier, Glades, Hendry, Martin and Palm Beach counties). By the April 14th release of the Drought Monitor, localized heavy rains had eased dry conditions in the Panhandle with the removal of all moderate drought (D1) conditions, and even some D0 in Jackson, Walton and Washington counties. 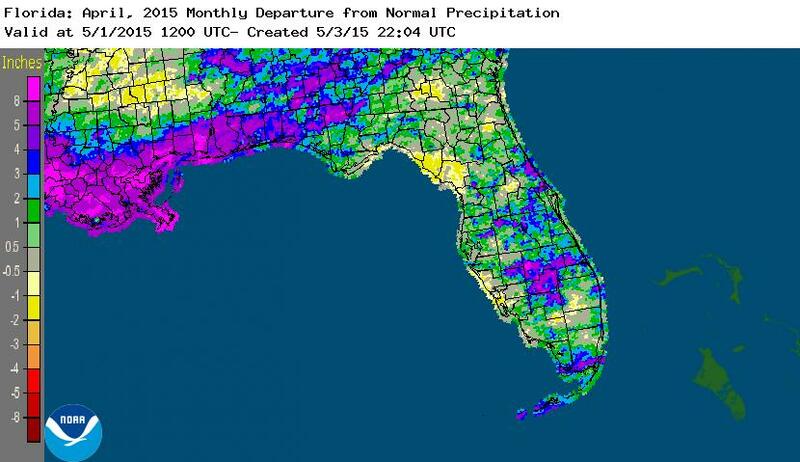 Around mid-month, additional rainfall in the Panhandle caused the complete removal of the remaining D0 conditions. However, the lack of rain in the southern part of the state caused the further expansion of D1 throughout the Everglades drainage basin. The area of severe drought (D2) conditions increased in size from roughly 1% of the state to 5%, to cover Collier, Dade, and Monroe counties. Based on data from the Drought Monitor, roughly 4.5 million Florida citizens are currently being impacted by drought conditions that are being reported in nearly 10% of the state. At the end of the month, the water level in Lake Okeechobee had dropped to under 14 ft., mainly due to regulatory releases.